I have been doing Weight Watchers since January. I decided to start using your meal plans, and I lost 4.5 lbs last week! Love these plans and the way you have the WW points listed! My husband and I especially loved the orichiette pasta dish! ❤️❤️❤️ Thank you so much for creating these meal plans with the grocery list! Please keep making these meal plans. I’ve been making some f your meals for a while but just joined weight watchers and ordered your fast and slow book. This will be very helpful for shopping. As I have celiac I may make some adjustments. Thank you! It would be great if you can do a gluten free week here or there. You are so amazing! Thank you so much for giving us these FREE healthy meal plans! With my second baby due in just a few weeks, these are going to make my life so much easier!!! Hey there! It would be awesome if you could make the meal plans in mind for just a couple. Maybe have an option between family size and couple size? My boyfriend and I always have SO many leftovers, even when we cut out recipes/or cut down on portion sizes. I love love love these meal plans and they have made my life so much easier! I have been a WW follower/user off an on since my first baby in 1993. I raised all my children on WW recipes and tried instilling in them the same philosophy you teach. They are all grown and gone and I slid backwards into eating fast, easy, and unhealthy since I wasn’t focusing on cooking every night like I did when they were growing up. I have come back to WW (because it always works, is more balanced, and fits into regular life). I came across your site and am in love! Especially since I am getting back into the game, I really appreciate your weekly menu plans and hope you don’t decide to get rid of them. Your meal plans with point listings and grocery list make it beyond easy! Thank you! I made your easy bagels this morning for a few visitors and they were not only a hit, but a head scratcher for some when I told them how easy and low points they were. Your site makes me pumped to get this weight loss train started again. I love your site so much! Your recipes are delicious. The meal plan and grocery list is very helpful. Thank you for the work you put into this!! It’s treasure! Thank you so much! I just discovered these meal plans and very excited to try them. Just what I was looking for! Definitely using these plans! Keep them coming, I love them! It totally helps me try new things because it makes it so easy to plan and shop! new to skinny taste and love it! when does the new weekly plan come out? I’m waiting on april 16th? Your weekly meal plans have really changed my ability to follow Weight watchers and STAY on it while still enjoying so many delicious meals. I wish I had found out about them sooner! Absolutely love this site!!! Just found it, while on my weight loss journey! I’ve tried a handful of recipes and have been so pleased!! Thank you so much for this, going to try the first weekly meal plan this coming week! Just made General Tso’s Chicken with the cauliflower rice. So delicious! I am new to your website – a friend recommended it and I am HOOKED. I LOVE that you have the WW points calculated for us! 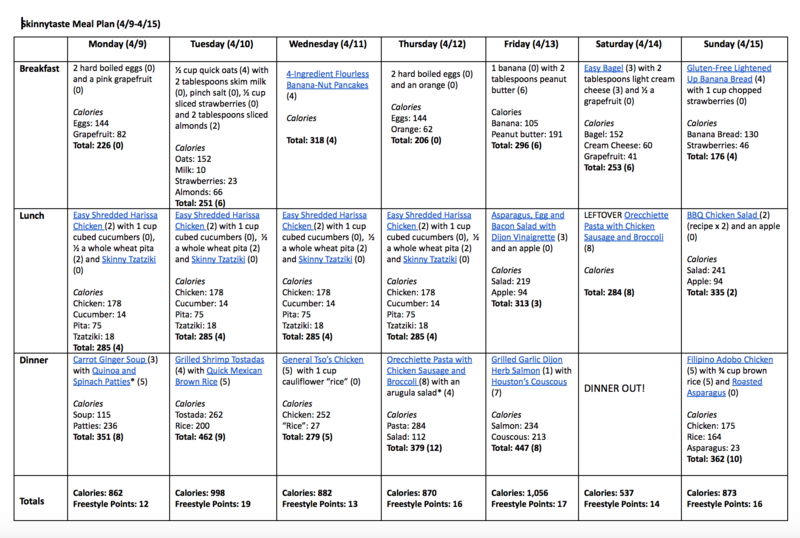 The weekly meal plans are incredible – I am amazed at how comprehensive this is. Thanks for your time and effort!! Please don’t stop ever making these meal plans and grocery list… It’s exactly what this busy mother-of-two with the working husband needs to ensure that we’re healthy and mama is kept sain!! Please keep these meal plans coming! I am relying on them weekly just to make it through the week. Mom to seven kids, trying to go back to work, and i dont have time to even think about doing this in a way i could actually count calories and points! I use these meal plans every week! Makes eating healthy so much easier than before. I would spend honestly at least 3 hours a week trying to come up with healthy meals that weren’t repeats and that would actually taste good! So easy and exciting to check each week to see what’s to eat, especially with working full time and running a business. Thank you! Thanks so much for offering the meal plans, shopping lists and recipes. They are soooo helpful! I hope that you will be able to keep offering this encouragement to cook and eat healthfully. I love your recipes and I LOVE your meal plans! It’s so handy and such a time saver when planning my weekly menu! Please continue! I think it is fantastic that you provide this–so helpful to new people trying to become better at planning & preparation–I have referred many to your site! Ok we’re going to try this week’s meal plan for the first time! Making a few adjustments…..doubling the breakfasts and lunches because it’s my mother and I following the plan. We don’t really care for Salmon in our house. Can another type of fish be used? Or any suggestions for an alternative fish dish? Also, can any of these dinners be made ahead of time? Just trying to simplify my life as much as possible and also stay on program! Super excited to start! Thanks so much! Sure, feel free to use any fish you prefer. Love your meal plans! Please keep posting them!! I love using your recipes and meal plans!!! It really helps that these are recipes that my family also enjoy so I’m not having to make multiple meals to please everyone. Please keep sharing! Thanks for posting the meal plan! Wonderful meal plan for this week. I’m gonna to start with your meal plan. Hope I can continue till 15-04. Thanks for this great information. Love the meal plan and recipes. Thank you!!!!!??? Going to try a couple new recipes this week. Thanks for the meal plan! I loved how you had a table chart for easy reference of your meals at the beginning of the year. Its not been showing up on my mobile page the past few weeks… If its not too much trouble, could you please include that in your weekly meal plan pages? Thanks! A friend just introduced me to this meal planning and I am super excited to try it – most everything looks delicious and doable! I really appreciate the grocery list, too. I love using your meal plans. So very helpful and an absolute health AND time saver! Thank you for all of your hard work and so selfelssly sharing your recipes with us. Thanks so much for posting these! I use them every week. It would be super helpful if you could put the calories next to each meal idea like you do with the points instead of only a cumulative total at the end. It would make it a lot easier to swap other meal ideas! Meal plans are the absolute best!!! Please please please continue these. I love love love these meal plans! These are exactly the kinds of foods I love to make and eat. I’m making the Harissa Chicken for dinner right now (in the crock pot) and it looks so delicious. Thank you so much for sharing these! Yes today i made your breakfast pizzas! Loved them. And I’ve made this harissa chicken. So easy (instapot) and so good. I understand that Harrisa shredded chicken can make six serving’s but I will replace this with left over chili, the quiche and minestrone soup. I freeze the harissa and have another week. Again Thank you! Please keep up the meal plans. I cook my dinners off your page all the time but I think the plan is what I need to get in gear. This is the best thing that could ever happen to me. I spend so much time meal planning, but now that I discovered this – I use it and adjust as necessary. Thanks for doing this!! I just realized you are providing plans so I’m going to try it this week! I’ve been doing eMeals and some of the delivery services but am not happy with either. The big thing I’m looking for but haven’t found yet is a good shopping list app to go with the recipes. Anyone have suggestions? These are awesome, thank you so much for posting!!!! I am excited to try this week’s meal plan! Please keep posting! I’ve been a fan of your site for a long time!! Love the meal plan and grocery list. Keep posting them!! 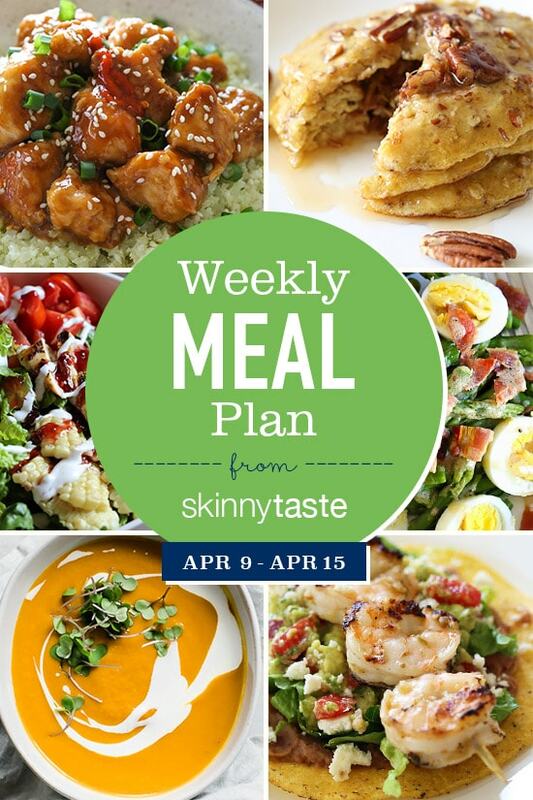 I just came to skinnytaste to see if a new meal plan had been posted and hurray! it has!!! Last weekend we went on a road trip to visit our daughter for Easter. We came home late on Monday, back to work on Tuesday. Normally that would really mess up any healthy eating for the rest of the week, but on Sunday morning I pulled up the meal plan, went online to my grocery store and placed an order for everything I needed to be picked up after we got home on Monday and was set for the week. Thank you for these plans Gina. The work you do really helps a lot! Love all of your recipes!! On a road trip right now planning put my week!! Thank you for calculating the WW points…so helpful. My go-to website.